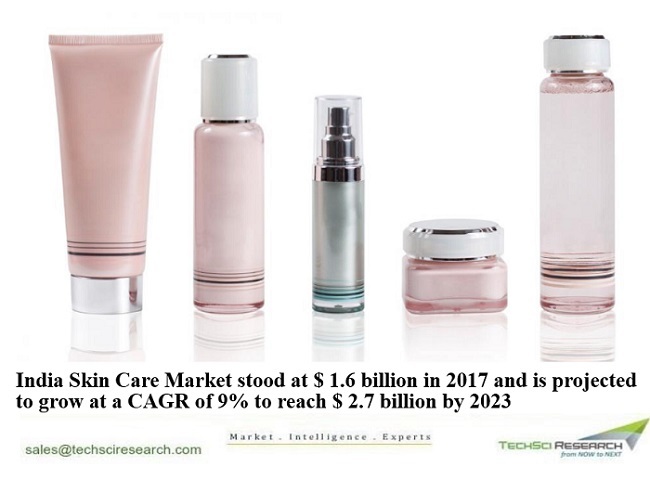 According to TechSci Research report, “India Skin Care Market By Product Type, By Origin, By Distribution Channel), By State, Competition, Forecast & Opportunities, 2023”,India skin care market is projected to reach $ 2.7 billion by 2023 on account of rising awareness about skin care products among people and growing demand for such products among youth. Moreover, increasing working women population along with rapid urbanization and rising disposable income is augmenting demand for skin care products across India. Additionally, new product launches coupled with brands extensions by skin care companies and expanding direct distributor and retailer reach is anticipated to fuel growth in the market over the coming years. Hindustan Unilever Limited, The Himalaya Drug Company, Emami Limited, Johnson & Johnson (India) Ltd, Oriflame India Private Limited, Nivea India Pvt. Ltd., Amway India Enterprises Private Limited, Procter & Gamble Home Products Private Limited, and Lotus Herbals Limited are some of the leading players operating in India skin care market. On the basis of type, India skin care market is segmented into facial care and body care, of which, facial care dominates the market owing to increasing sales of facial care products, especially moisturizer sales, which are driven by increasing demand for skin whitening and brightening creams. Companies like Hindustan Unilever Limited, The Himalaya Drug Company, Emami Limited, etc., are increasingly focusing on product innovations, media campaigns, relaunching their products with more compatible packaging and highlighting the natural ingredients in products, which is likely to enable companies in strengthening their presence in the market. “Rising penetration of international players in India skin care market along with emergence of online brands such as Nykaa and Purplle is expected to positively influence the market. Moreover, skin care manufacturers are adopting aggressive marketing strategies and digital media to create awareness among people about such products, thereby resulting in increased visibility of skin care products. Additionally, rising focus of companies on expanding their direct distribution network and increasing presence in rural areas is further expected to fuel growth in India skin care market over the coming years.” said Mr. Karan Chechi, Research Director with TechSci Research, a research based global management consulting firm. “India Skin Care Market By Product Type, By Origin, By Distribution Channel), By State, Competition, Forecast & Opportunities, 2023” has evaluated the future growth potential of India skin care market and provides statistics and information on market structure, size, share and future growth. The report is intended to provide cutting-edge market intelligence and help decision makers to take sound investment decision. Besides, the report also identifies and analyzes the emerging trends along with essential drivers, challenges and opportunities present in the India skin care market. Can a LED Bulb Really Last For 10 Years?